“The only thing that’s changed is everything.” Apple has done it again! At yesterday’s Apple Event we were introduced to the new iPad Pro, the updated iWatch, new Apple TV, new IOS 9, and the new iPhone 6s and 6s Plus. The next 3 months will be filled with new Apple products for many of us here at Earl & Brown. Here is the roundup of the two most anticipated products from Apple, the iPhone and iPad. The iPhone 6s now comes in 4 colors. You can choose between silver, gold, space gray, and the new addition of rose gold in Apple’s custom alloy. The phones are also covered by a brand new glass to save us from the tumbling fall that our phones make more often than we would like to admit. According to Apple, it is the strongest in the industry. The All New 3D Touch. 3D Touch is the new technology that we never knew we needed, but now that it is out there, we need it! 3D Touch can now sense how deeply you press on the display. The deeper you press the more options become available through Peek and Pop, and Quick Actions. Peek and Pop will now allow you to preview content and then act on it without having to actually open it. Peek at emails to preview the message, and either pop it open to read the entire email and reply by pressing a little deeper or close the preview it by letting go to go back to the inbox. Peek at a website someone sends you in a text, and either pop it open into Safari by pressing a little more deeply or stop pressing to go back to the original message. Quick Actions is also another tool within the 3D Touch technology. Quick Actions lets you do the things you do most, faster and in fewer steps in your favorite apps. You can start a message to one of your favorite contacts, take a quick selfie, or get directions home without having to go into the different apps. It can all be done from the Home screen. 3D Touch works with the new IOS9 to make things we do every day more natural and intuitive just by pressing deeper. 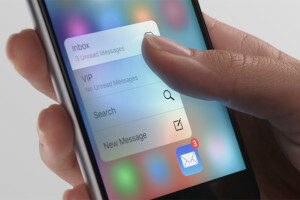 With 3D Touch, the iPhone comes to life. The camera is one of the most important features on our phones. 15 years ago we didn’t have a handy camera in our pockets, and in 2002 when the first camera phone came out, I don’t think any of us thought the camera on our phones would’ve become what the new iPhone 6s camera is now. The camera is more advanced than previous generations with a 12-megapixel iSight camera, 4K video capability, and the all-new 5-megapixel FaceTime HD camera to take the perfect selfie. To make your camera’s more advanced, Apple also introduced Live Photos. Live Photos can take a still photo and instantly turn frozen in time memories into living memories. When a photo is taken with the iPhone 6s, the moments just before and after are also captured, capturing the sounds and movement of the memory, to make the still photo into a living memory. Just press anywhere on the photo and bring it to life! 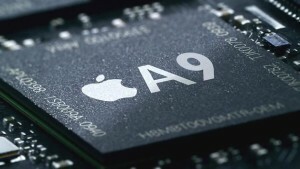 Apple has now created the most advanced chip in a smartphone, the A9 chip. The A9 chip is Apple’s third generation chip with all new 64-bit architecture and is 70% faster than the previous generation chip. The M9 motion co-processor is integrated directly into the A9 chips so you can do more, for longer periods of time, with a better battery life and amazing performance. The iPhone has become the tiny computer in our pockets. With twice as fast LTE Advanced, and Wi-Fi connectivity. We can browse the web, download apps, and stay connected faster than ever before. Unfortunately, Apple is still having your phones start at 16GB, but the pricing isn’t much different than previous iPhone releases. There are many ways to pay for the new iPhone. You can buy the phone without a contract, pay monthly, or pay for the phone with a two-year contract. Here is the pricing for a two- year contract. 16GB is $199, 64GB is $299, and the 128GB is $399. For the iPhone 6s Plus you can expect to pay a $100 more than the 6s for the three different sizes. The phones are available for pre-order on September 12th, but you won’t have to wait too long for your phone to arrive. 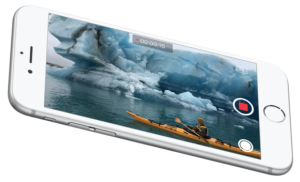 The new iPhone 6s and 6s Plus are available September 25th. The biggest news about the iPad Pro is that it is huge! Coming in at 12.9” Retina display, it is over 3” bigger than the iPad Air 2. The iPad Pro comes in 3 different colors; space grey, gold, and silver. It has four speakers on all four corners to provide better sound, and a wider frequency range than any other iPad. With the new keyboard and Apple Pencil the possibilities are endless. The iPad Pro now has the ability to multitask! It can now Slide Over, Split View, and Picture in Picture. Allowing you to access shortcuts right at your fingertips without affecting your productivity. Slide Over now allows a second app to open without having to leave the one you are currently in. Respond to a text while reading a book on iBooks, then slide the second app away and get back to the original app. If you need to have two apps open at once, you’ll love Split View. Split View allows two apps to be open and active at the same time. Plan a road trip with Safari and Maps side-by-side, or watch a movie and write a paper all at the same time. FaceTime is great, but it can also stop productivity. Watching a funny cat video can help us unwind after a long day, but sometimes an email comes in and you have to answer it. To fix these issues, and make everyone a lot more productive, the iPad Pro now allows Picture in Picture. While watching a video or talking to someone on FaceTime, press the Home button and the video screen scales down to a corner of your displace. Tap to open the second app and start using it while your video continues to play, or you continue having the conversation on FaceTime. The iPad Pro is making sure that productivity isn’t an issue any more. Hand off now allows you to pick up on your second device where you left off on your first device. You can now finish up an email you started on your Mac on your iPhone, or browse an awesome website on your iPad and continue to browse on your Mac. It all happens automatically when your devices are signed into the same iCloud account. Like the iPhone 6s, the iPad Pro has redefined what the iPad is capable of. The new A9X chip is Apple’s most powerful chip and gives the iPad Pro the power to do all the work you could do on a PC and more. The iPad Pro is also faster than the previous generations allowing for quicker work and a better experience with up to 10 hours of battery life. The iPad’s pricing may surprise most, especially since it doesn’t have as many storage options as previous iPads. The iPad Pro with Wi-Fi capability starts at $799 with 32GB, and has a second option of 128GB for $949. For Wi-Fi and Cellular capability, there is only one option, 128GB for $1079. Thankfully Apple gave us some time to save up! The iPad Pro does not come out until November 2015. Earl & Brown sells many unique cell phone cases for every lifestyle. If you would like to view a catalog of our iPhone 6s and iPad Pro accessories please fill out the quick message box below or email info@earlbrown.com for more information.